Keeping that in mind, does it make sense to treat visitors on their first interaction the same as those on their sixth? Trying to get a visitor at the start of the journey to purchase immediately is a waste of time and energy. It might even drive them away. Doesn’t it make more sense to treat visitors based on the next stage in THEIR journey? This is the start of the journey, when someone comes in contact with your brand for the first time. Based on the framework you’re using, this stage is known as top of the funnel, awareness, or acquisition. The concept is the same; it’s the first interaction. At this point, it’s likely that the visitors don’t know much about your product or how much you can help. Your job is to capture their interest and get them to come back. At this stage, a conversion isn’t a sale, it’s a repeat visit or better yet, an email subscription. If visitors share their email, you always can bring them back to your site. You capture emails with engaging copy and educational content. Your copy should explain to visitors the purpose of a product such as yours. Talk about the real benefits behind it because your visitors don’t care about the features at this point. Remember, they aren’t even thinking of paying for your product at this point. Then, use content to get them to subscribe. This could be an e-book, an email course, a video course, webinars, or any other download that would help the visitor. Ramit Sethi only focuses on converting visitors to subscribers on his blog, I Will Teach You To Be Rich. He has numerous paid products, some priced at thousands of dollars, but visitors won’t find them anywhere on his site. Instead, visitors see an option for an e-book on the home page. Click-throughs to any of the product pages reveal only lead-generation forms. That’s because Ramit knows it’s easier for him to convert a visitor to a subscriber first, and then into a customer, instead of pushing the sale at the start. Here’s another example: BitNinja, a server security software provider, found that not many people were purchasing its product. Even with a 7-day free-trial offer, the conversion rates were low. Instead of trying to convert first-time visitors into customers, BitNinja decided to collect subscribers. It set up an exit-intent pop-up for an e-book about server security. This led to a 114% increase in subscriber conversions. Even better, the leads were more likely to convert to customers. Now that you have their email addresses, you can bombard them with sales pitches. Yay! Your subscribers are still not ready to buy at this stage. However, they are curious about your product. They understand that it can help them but they aren’t fully sold. They need more information. That’s why you nurture them. You feed them more content, content that delves deeper into the problems they face and how to solve them, subtly mentioning that, yes, your product solves the problems too. HubSpot does this really well. It breaks this stage into a series of conversions. At each conversion point, it gathers a little more information about you – a process called progressive profiling – before it feels like you’re ready for the final conversion – a free trial. 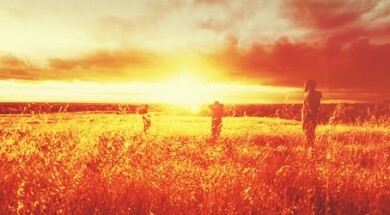 When you first subscribe to the HubSpot blog, you receive regular updates from its blog. Occasionally, you are sent an e-book that helps you solve a certain problem, but also positions HubSpot as the best way to do it. To download the book, you need to visit a landing page, which pre-populates the information you gave when you signed up, such as your name and email address. It also adds one or two fields to collect new information about you, like your place of employment and job title. In this example, HubSpot filled in my name, email address, and place of work. By completing the form, I qualify myself as a lead and move to the final conversion point of this stage – the free trial or demo. At no point in this stage is HubSpot trying to get me to buy. However, it achieved numerous conversions by getting me to download e-books and scheduling a demo. Your process doesn’t need to be as advanced as HubSpot’s, especially if you don’t have the tools for it. But you need to understand what your success metrics are for this stage. Again, don’t optimize for sales. Instead, focus on getting that little buy-in, like clicking through to your blog post or downloading a book, until you reach the final conversion of a free trial or some other commitment from the prospect. LinkedIn does this in a really simple way. It sells premium subscriptions and products like LinkedIn Ads, but it can’t really push you to buy on the site or it risks disrupting the user experience. Instead of focusing on the up-front sale, LinkedIn gets you to qualify yourself via emails. 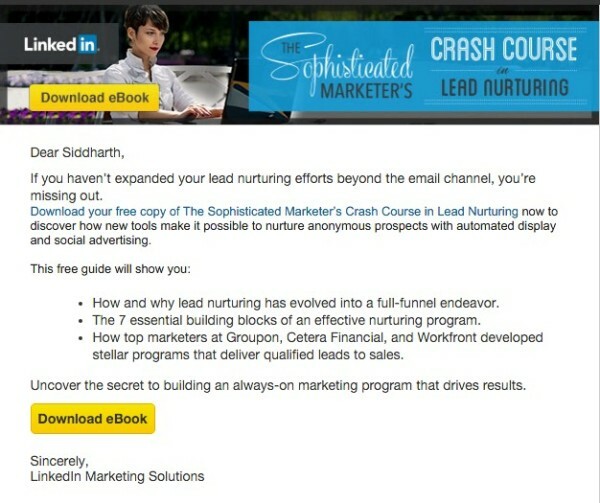 Apart from the regular LinkedIn notifications, I also received a targeted email for an e-book on lead nurturing. There is only one call to action – download the book. LinkedIn knows I’m not ready to buy – I’m still in Stage 2 – so all it cares about is getting me to show some interest by clicking through, and that’s what the email is optimized for. When I click through and download the book, I’m signaling that I’m interested in LinkedIn’s lead-nurturing tools. That takes us to Stage 3. This is it! Your lead is at the final stage. She understands your product, she’s even tried it out, and now it’s time, finally, to optimize for the sale. Now, you might think that your product is so awesome that everybody who tries it will be hooked and they don’t need a nudge to purchase. Well, that’s great, but don’t leave the sale to chance. Buying your product means spending money, and no one really loves spending money. Yes, some will convert without a nudge but many will hesitate. There will always be objections. A more personalized touch might be necessary at this stage. Every person has different objections, so you need to address them individually. Ask the prospects to contact you with their questions or doubts. There usually are last-minute objections/resistance and most customers will leave without voicing them without a prompt or invitation. By reaching out to ask, you show that you care and show them how your product solves their problem. Offer to jump on a call with them. Sometimes people just don’t have the time to learn a new product, especially if it’s complicated. By hopping on a call with them, you can walk them through it and get them to that “aha” moment sooner. Invite them to a webinar. If you don’t have the resources for a one-on-one conversation, get the prospects to sign up for a webinar where you walk through the product. You can record most of it and only appear live in the Q&A session at the end. For some extra sales, offer viewers a limited-time discount at the end. Here’s an example from Heap, an analytics company. After signing up, I get an email explaining the next steps with a link to a tutorial video. While this is standard, the next part is what makes Heap different. Heap’s support team member, John Clover, goes on to tell me I can schedule a one-on-one tour with him, and even invites me over to the office. I took him up on the call and he was able to answer all my questions. Sometimes, you want to reach out to the customers while they are still in your app. With in-app messaging, you can automatically start a chat if you feel like they are about to bounce. HelloMD.com, a site that connects medical marijuana patients with doctors online, does this well. 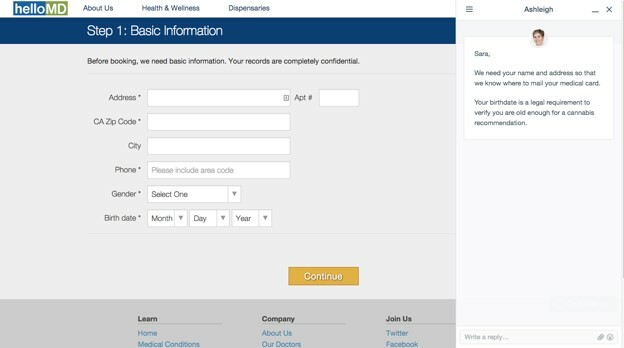 Its onboarding process consists of filling out a long medical form before booking a call with a doctor. If the prospect of completing a lengthy medical questionnaire is not bad enough, customers also had to answer numerous questions about the privacy of this information. At a 7% conversion rate, HelloMD needed a more hands-on approach. To solve this, HelloMD started using in-app messages and automatically displayed them according to the stage where the customer was. The message also encouraged two-way communication, allowing prospects to voice their concerns. This simple step boosted the conversion rates to 25%. Just remember, at this stage, it’s OK to make the pitch. You’ve done the hard work by successfully guiding your visitor through the entire journey, and now you need to optimize for the sale. What stage are your users in? When optimizing your site or sales funnel, keep in mind what stage your users are in. If there’s a mismatch between what they are expecting and what you’re optimizing for, you won’t be successful. Your conversion rates will always remain low and you’ll never figure out why. Instead, focus on moving them through the funnel and measure success based on conversions from one stage to the next. Want to learn more about how to convert visitors into sales with an assist from content marketing? Make plans today to attend Content Marketing World. Use code BLOG100 to save $100 on registration.